This is comfortably the best Xbox One deal this week. Actually, this is the best we've seen all year for Microsoft's diminutive console. £229.99 is a great price for this bundle, especially as the 1TB Xbox One S alone usually goes for closer to £250. We're seriously impressed with the choice of games on offer, too. PUBG (aka PlayerUnknown's Battlegrounds) comes in the box, then you choose any one of the other games to include, too. Wow, that's a tough choice of which game to bundle with PlayerUnknown's Battlegrounds. Far Cry 5 or Sea of Thieves seem to be the obvious choice as they're super new and costing at least £40 on their own. Forza's a fantastic game but can be bought for just £21.79 elsewhere. 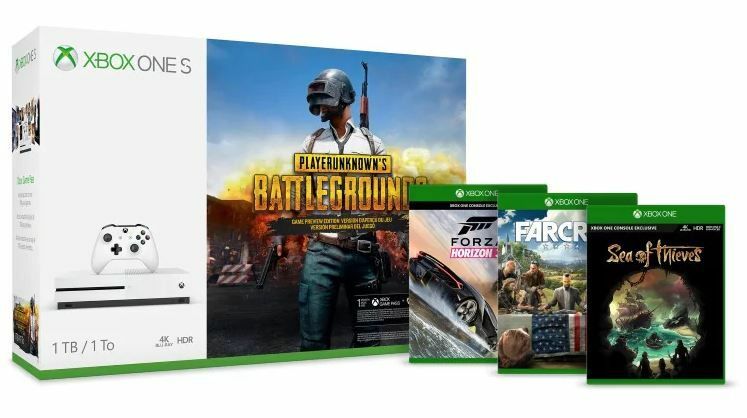 Whatever game you go for, you're getting a great deal on this Xbox One bundle. We can't stress enough the importance of getting a 1TB console like this one over the default 500GB option. Most modern games comes with a mandatory install (yes, even if you have the disc) and we're typically seeing these sizes weigh in around 50GB, so it doesn't take long to fill a 500GB drive. The extra space comes in handy with the free games you get with an Xbox Live Gold membership, too. If you're needing a new membership, by the way, we've listed the latest Xbox Live Gold 12 month subscription prices below. Don't forget, you also need it to play Xbox games online, but the free games each month and member-exclusive discounts more than make up for it.